A Master Plan for Venetian has been in the works for many years. The purpose of the plan is to create a “map” of our 4-acre property with areas designed to maintain the serene environment of our pool while recognizing that the pool and its amenities need updating and improvements as it ages. A Master Plan design was created in 2011 and presented to the Board of Directors at that time; however, the plan was never executed. In 2016, a Master Plan committee was re-formed to look at moving this forward. In 2017, a survey was developed by the MP committee and sent to the membership. The committee used the information from the survey to update the 2011 plan with those items that were prominently requested by members and realistic in scope. The plan from 2011 was designed by Todd Hill (pool member, former board member, and landscape architect), so the committee asked him if he would make updates to the design that were requested by the MP committee. These changes and updates were made and the new MP was approved by the MP committee. The MP was presented to the board at their meeting on August 13, 2018. The board voted unanimously to approve the MP. The Master Plan was posted on the website and sent to all members via eSplash on September 6 and then presented at the VPCA Annual Meeting on September 13, 2018. We are now sending the MP out one more time to the membership for a 2 week review and comment period. 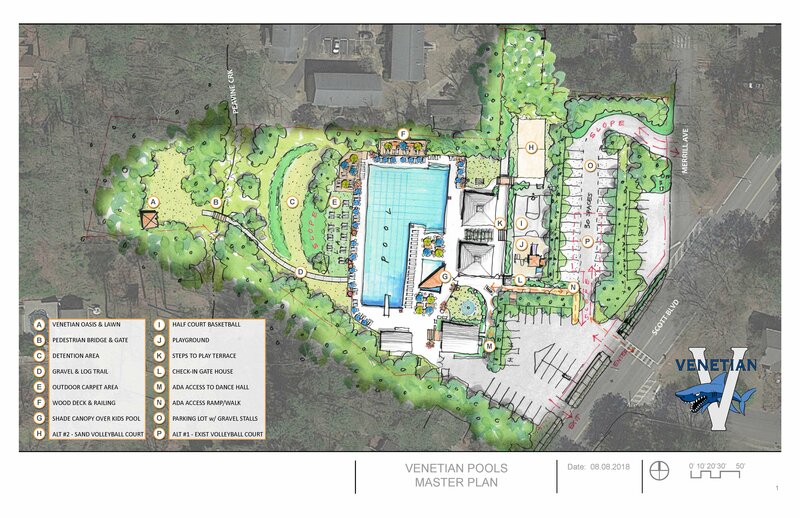 If you have any questions or comments, please send them to building.grounds@venetianpools.org. The plan you see here is a site plan – meaning that the exact materials and surfaces aren’t detailed in the plan, but how the land will be used is shown. Note from communications: I tried to provide the largest size file to fit into the eSplash format. For better viewing, you can download the file here: VPCA_Master_Plan_2018.jpg and the .pdf has been posted under Member Matters. I. Half-court multi-use court – for basketball, or pickle ball anyone? !